Well here’s an interesting post on the Cambria website’s blog! How amazing it is the way things come to light. When Cambria was being restored a horseshoe was found attached to the wheelhouse. An appeal was made to try to discover how it came to be there, but nobody seemed to know. Then recently William Collard came up with an answer – a good luck symbol, being the shoe worn by a famous racehorse. He found the information in a collection of articles called ‘Thames at War’ by Bernard Drew. The blog goes on to quote an extract from the articles about a trip on board Cambria that Mr Drew took in WW2 when “Cully” Tovell was skipper. It is a fascinating account of life and work on a Thames sailing barge in war-time. And, interesting for me, the other two members of the crew came from Grays. Here’s the link to the post on the Cambria blog. with Paul and Jasmine Armour-Marshall. 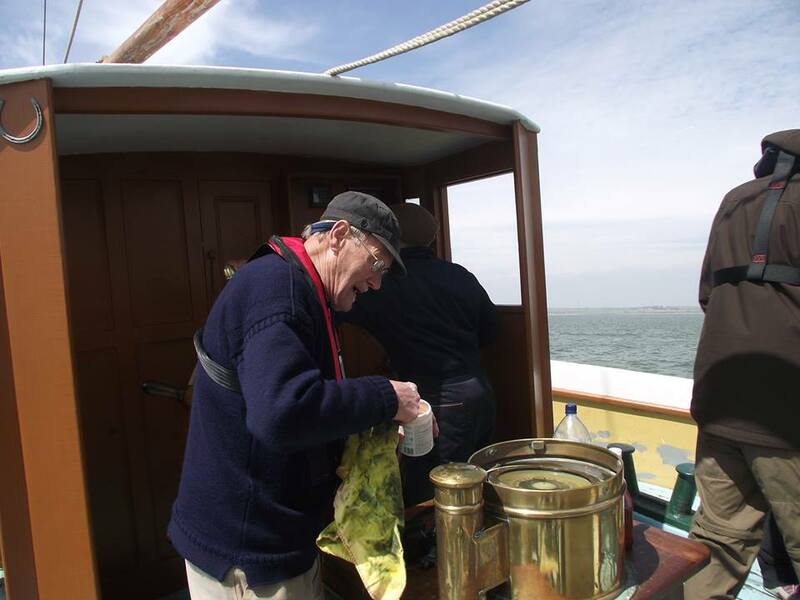 At last week’s SSBR Committee meeting we talked about sb Ironsides and heard that Toby Lester, owner of Ironsides, hoped to have her sailing again this summer, with more restoration work after that. A lot of new steel has been put into the barge. Here are the facts about Ironsides – Staysail Class; Bob:- Swallowtail with ‘tower’ emblem on blue ground. Official No 112710, 78 ton; Built of Dutch iron at West Thurrock in 1900 by Clarke & Stanfield; 85 x 20.3 x 6.4. Owned by A.P.C.M. and sold to L.R.T.C. in 1928; she was converted to a motor barge in 1938 and traded to northern France. 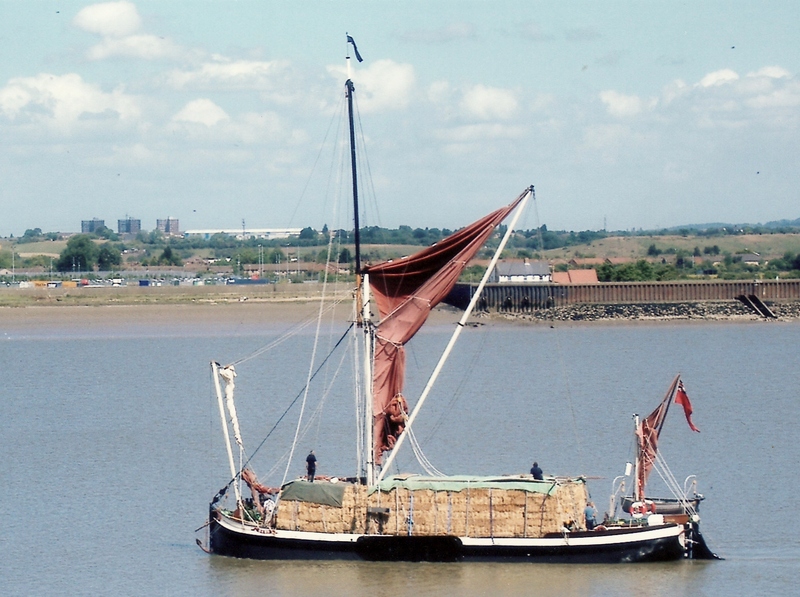 She was sold to Alan Reekie in 1968; re-rigged at Brentford and became a successful racing and charter barge. Afterwards owned by Mark Tower, she was based at Maldon / St Katherine’s. From 2003 she has been at Faversham for refitting. Now owned by Toby Lester and Linda Hoy who plan to have her sailing this year after an extensive refurbishment to her hull, deck and topsides. We wish Toby and Ironsides all the best for the sailing season. Photos courtesy of sb Ironsides. Here’s an interesting read from the East Anglian Daily Times website, (EADT24). It’s about the female Mate of the sb Victor. This is the link. A few ladies might have something to say about it. 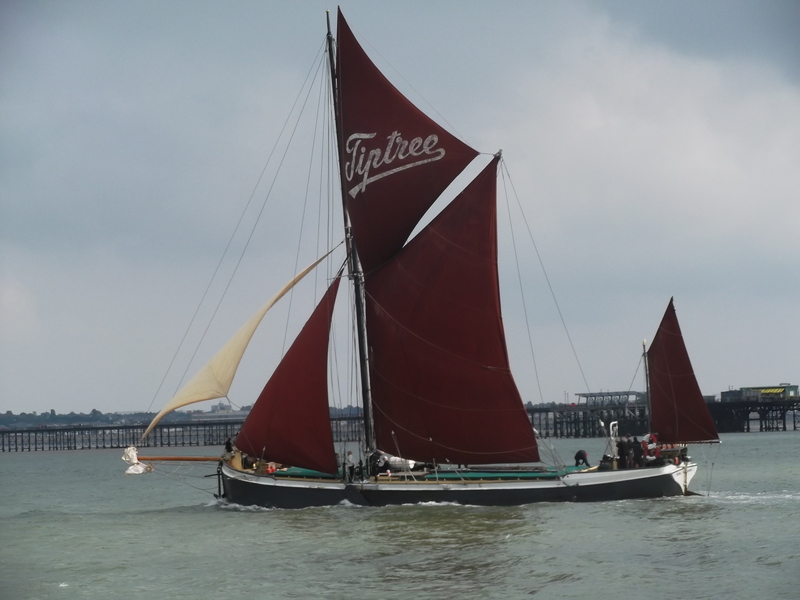 “Dawn is the last of the full-size Thames Sailing Barges built with a tiller. It is the aim of the Dawn Sailing Barge Trust to continue with her restoration so that she is completely back to 1897, her launch year. The next phase is to replace the wheel steering with tiller steerage. The next will be the steel mast and spars with traditional wooden spars. There are many smaller details that will keep the Trust busy for a long while to come, but when complete she will be a full working example of Victorian maritime transportation actually able to carry a full cargo under sail. Our picture, courtesy of Bill Sutherland and taken from his window, shows Dawn taking hay upriver to St Katherine’s Dock recreating the journey she and many others stackies would have made in their heyday. 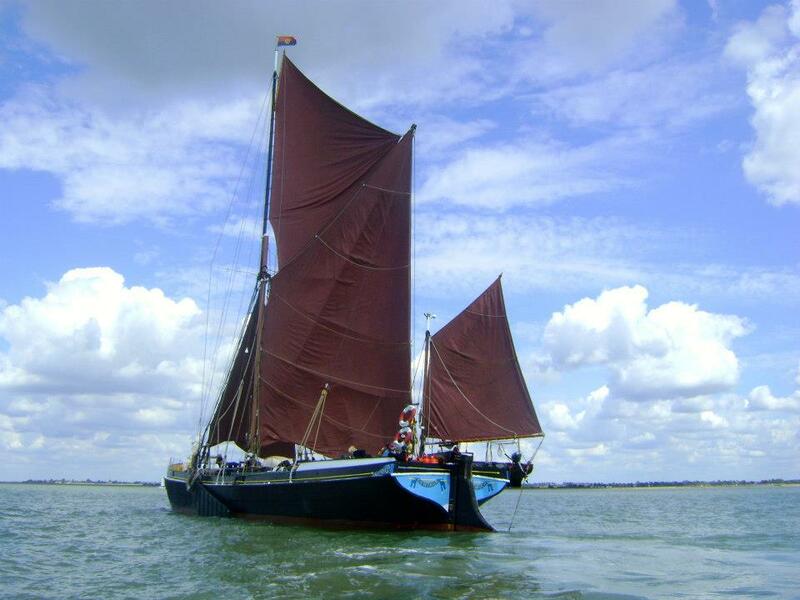 There’s a good article in The Daily Telegraph about Thames barges. Written by Adam Lusher, it describes his joining the crew of Centaur for the 2013 Pin Mill Match. “…….paying crew members can choose their own activity level. Those who wish can take a turn at the winch. The seriously enthusiastic can train to be mates and skippers. Others, however, prefer to help cook lunch or simply to admire the view. Here’s Adam taking a turn on the winch with mate, Chris Martin. We would just point out to Adam, though, that tremendous as TSBT’s work with Centaur and Pudge is, there are other Trusts working hard to preserve individual barges, several of them now proudly sailing as members of the active fleet. Here’s the link to the full story. Well worth a read.